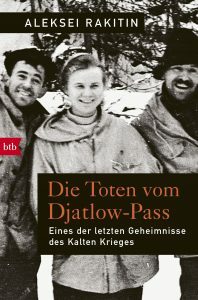 The German translation of Aleksei Rakitin’s thrilling documentary about the famous DYATLOV PASS INCIDENT has been published by btb/ Random House. The book comes with an epilogue by Oleg Kashin. This book makes a new attempt to analyse all of the information available up until today about the mysterious deaths of the group of Sverdlovsk tourists on the Dyatlov Pass in the winter of 1959 and to evaluate them for the first time without any of the mystic suppositions that have dogged this unexplained event.